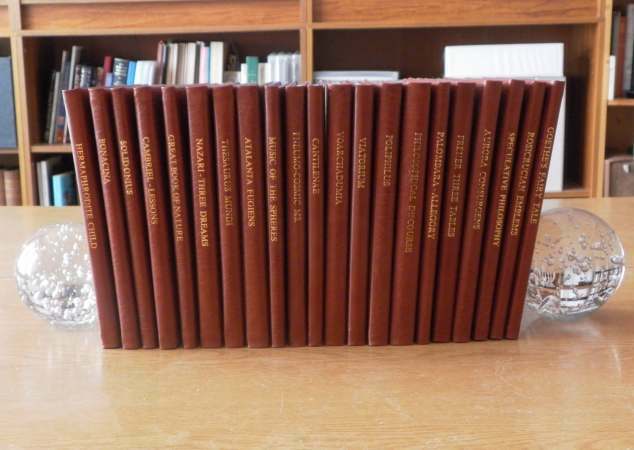 The Magnum Opus series of Hermetic Sourceworks, currently some 46 volumes, is by far the most significant alchemical publishing venture in recent times. I began this in 1979 and continue today publishing major alchemical works in English editions. Though most other contemporary publishers of alchemical books merely reprint editions from the late 19th and early 20th century revival of interest in alchemy, the Magnum Opus series has always sought out important alchemical works in manuscript and printed books that are not available in English editions. Often it took me many years to find someone to translate a work for the series. For example, I tried for ten years to find someone to translate the Voarchadumia, before I finally found Paul Ferguson willing to undertake this. Also I had to do much primary research, visiting many libraries seeking rare manuscript material. The series contains many of the most important and key works of alchemy, such as the Rosary of the Philosophers, the Splendor Solis, Crowning of Nature, Amphitheatre engravings of Khunrath, Steganographia, three separate works of Robert Fludd, the Atalanta fugiens, Voarchadumia, the complete Aurora consurgens amongst others. The series thus focusses on issuing editions of source material, rather than providing an individual interpretation. Collectors of this series thus have in their hands texts which enable them to fully appreciate the breadth of alchemy writings. The first book in the series was issued in a small edition of only 100 copies in 1979. This was my edition of the large early 17th century engraving called the Magical Calendar. I deconstructed its elements and printed it in book form. It sold out rather quickly, so I pushed on with some other works. These were the days before personal computers, and having no money for professional printing, I had to devise my own printing and hand binding techniques. 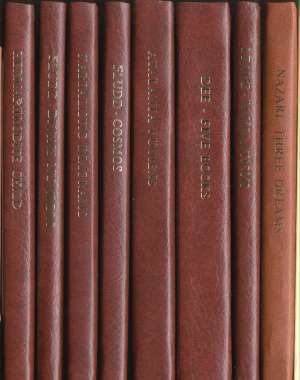 This hand binding in small batches has continued even 34 years later, making for a uniform series. So these are no mass market books, but instead are hand crafted. Apart from the first few years, I have not sold these through bookstores but only direct to customers. Each book in these limited editions is individually signed and numbered by myself. As with any limited edition item, the Magnum Opus books appear now to be a good investment opportunity. When a title goes out of print, people wanting to buy a copy find that the price on secondhand web based sellers such as abebooks will have trebled. There are only a handful of individuals holding complete sets of the Magnum Opus series, as they would have had to be collecting since the 1980s. If one conservatively estimates each volume to be worth £100 ($150) then a complete set would cost today a minimum of £5500 ($7500) and probably much more. People buying copies today will find that, if they are prepared to hold on to these for some years, then the price will increase considerably. One also has to bear in mind that I will not be able to continue publishing and binding up copies for much longer and when I stop publishing the series, it will doubtless become more sought after. to buy the Magnum Opus books ? like any other book ? particular book to become available ? Magnum Opus books are prepared. are available right now to buy ? free on the internet ?